The Dutch education system recognizes that students need to have a fundamental understanding of physical geography. That is why topography, the study of the earth's physical features, is part of the national curriculum for secondary school education. Dutch students are required to learn the locations of 300 specified cities, bodies of water, and mountain ranges throughout the world. This helps them understand the dynamics that drive political power, international trade, industrialization, climate change, national alliances, and many other important occurrences related to geography. Hunink's students say they prefer using the Topografie in de Klas website for studying topography. Although there is standardized curriculum to get students prepared for their topography examinations, one teacher, Dennis Hunink, didn't think this was enough. So he used ArcGIS Online to create more contemporary, web-based course materials for his students. Hunink began teaching geography eight years ago at DevelsteinCollege in Zwijndrecht, a town located in the suburbs of the port city of Rotterdam. "Initially, I just used the same materials that my fellow geography teachers were using for my topography classes," he said. "After a few years, though, I began to wonder if there were better materials available on the web to help my students master the designated worldwide locations for their exams." He soon discovered that despite the vast resources available on the Internet, he was unable to find the exact materials his students needed. "I found some websites that provided good information, but they weren't particularly easy for the students to use because the displayed maps were not the same as those they used in their exams," he said. "More importantly, though, I found that the vast majority of the educational mapping materials available on the web lacked a real didactic vision; nor were they cartographically correct." 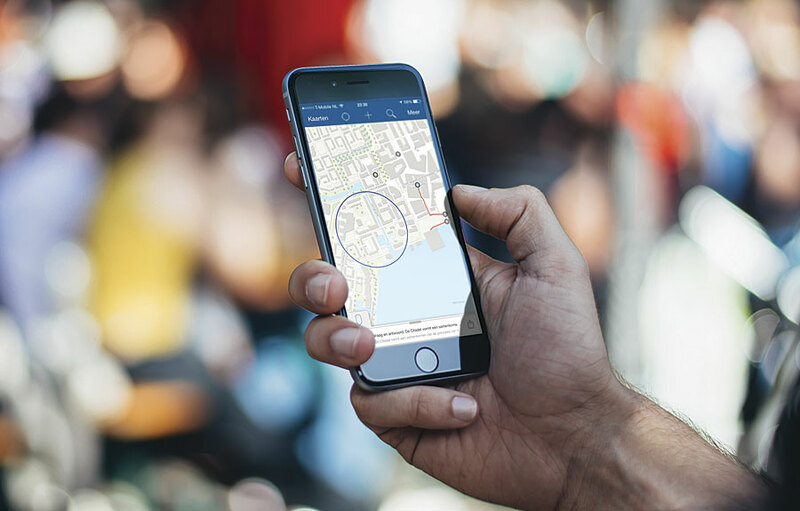 Hunink had taken several courses on GIS and cartography while studying social geography at Utrecht University, so he decided to explore the possibility of creating the online mapping resources he was seeking. He spoke with some Dutch experts on geography education and determined that an integrated method to teaching topography was needed. Commercial publishers of educational materials just weren't providing this. "I have some web development skills and thought it would be useful for my students if I created a website that allowed them to easily find the materials they needed for my topography course and prepare for their examination," said Hunink. "I got in contact with Esri Nederland B.V. [Esri's distributor in the Netherlands], and they were enthusiastic about my project. They provided me with an ArcGIS Online organization account, which allowed me to use the available APIs to develop the maps for the class and server space for file storage." Students pick specific features, such as rivers or cities and then engage in a series of questions about them. The instructor reviews the results online, and the student can save all materials for future reference. Students can also share their results with friends via Facebook and Twitter. By the end of 2012, more than 100 schools (about 15 percent of all secondary schools in the Netherlands) were using the Topografie in de Klas website. Today more than half of the students taking topography classes use the website. Although Hunink indicates that it is difficult to say with absolute certainty that Topografie in de Klas has boosted learning outcomes, he has a wealth of anecdotal evidence that this is his students' preferred method for studying topography. In 2015, Hunink completed Veldwerk 2.0, a program that uses Collector for ArcGIS to get students more engaged in their required fieldwork exercises. "I found indications suggesting that the website makes a positive impact on the students' work," said Hunink. "But, more importantly, the students keep telling me that learning topography is much more effective and supportive using the website. Many of them became very frustrated when they had to learn the course materials with low-quality printed maps, and some even felt like giving up." After seeing that ArcGIS Online worked for Topografie in de Klas, Hunink explored options for his students to use the program in the field. "I had been using the Collector app with ArcGIS Online for two to three years in my classes but wanted to set up a formal program that could be used by other teachers," said Hunink. In early 2015, he completed Veldwerk 2.0, a program that uses Collector for ArcGIS to get students more engaged in their required fieldwork exercises. Taking their smart devices outside, students follow a displayed map that includes markers at specified locations. With Collector loaded onto their smartphones or tablets, students can answer all the questions displayed on the map, whether they are connected to the Internet or not (thanks to the app's offline mode). The teacher tracks their progress. Like Topografie in de Klas, Veldwerk 2.0 provides a digital version of an existing course requirement in Dutch schools. "Implementing GIS this way works well in our educational system here in the Netherlands," said Hunink. "The teachers are familiar with the existing coursework, and it is an easy step for them to use digital maps rather than printed ones. They don't feel intimidated by a GIS program. Hopefully, by building their confidence in this way, both the teachers and students will begin to create their own content with ArcGIS Online." To expand the use of Veldwerk 2.0, Hunink and Esri Nederland began to collaborate. Hunink teaches the Veldwerk 2.0 workshops in a classroom provided by Esri Nederland. The company also publicizes the workshops as an official course. Today approximately 40 teachers from 20 different schools have completed the workshop and are using Veldwerk 2.0 in their classes. "We started this project with Dennis during the spring of 2015," said Dene Mastwijk, part of the educational team at Esri Nederland. 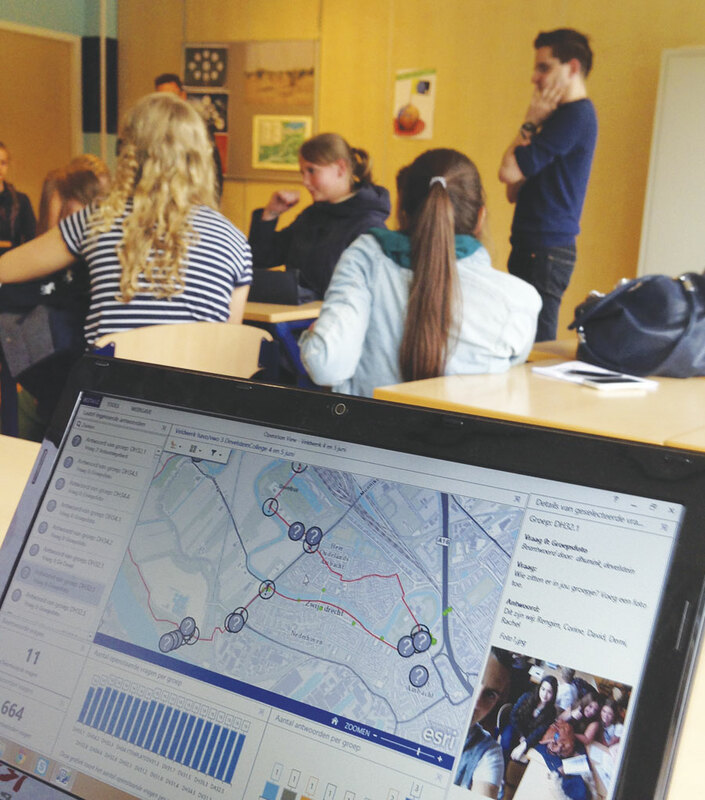 "We host Veldwerk 2.0 workshops throughout the year so that teachers can learn how to use ArcGIS Online and implement it into their students' fieldwork exercises. After a teacher has completed the workshop, their school receives free access to their own ArcGIS Online organizational account for a year." On a recent visit to DevelsteinCollege, Hunink's students gave a demonstration of Veldwerk 2.0 to Alida Oppers, director general of primary and secondary education in the Ministry of Education, Culture, and Science. "This is a great example [of] how innovative technology can be used in education," Oppers observed. "It makes classwork more visual and allows students to experiment. This type of education is effective because the students remember the lessons much better and they get the opportunity to reinforce their lessons outside of the classroom."